October | 2016 | The British in Crete, 1896 to 1913. Well, someone got a medal. Despite British soldiers, sailors and marines being involved in the European Intervention in Crete for nearly 15 years, and in doing so suffering considerable casualties albeit overwhelmingly from disease, no medal was issued to the British military personnel involved. However, a medal was struck and apparently issued to the Greek military. The one shown was up for sale in 2007 and described as being a ‘Service Medal (for revolution in Crete)’. Translated, the obverse has the words ‘For Faith and Country’ set around a cross bearing the date 1898; the reverse the word ‘Freedom’. 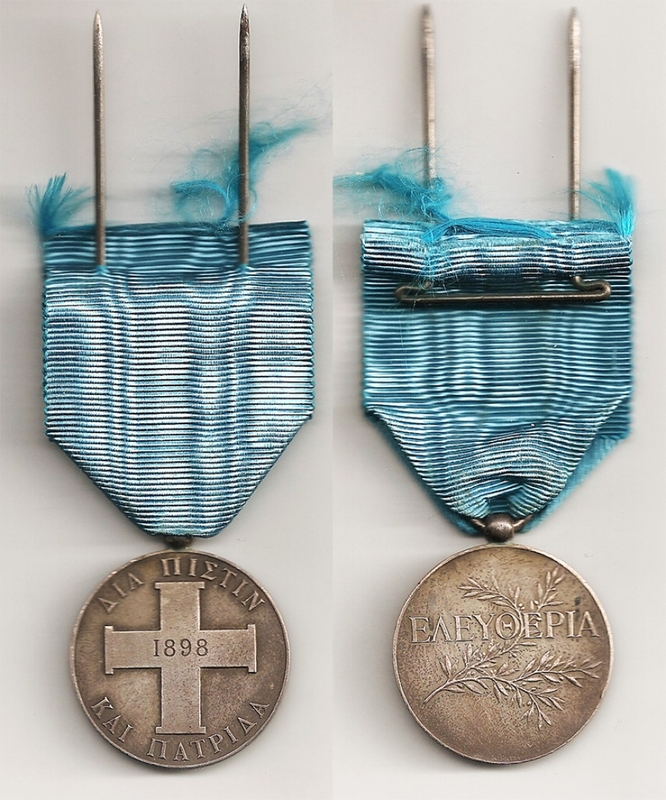 Some British soldiers did, however, received medals while in Crete, albeit for the Sudan Campaign; participants being eligible for The Queen’s Sudan Medal and/or The Kedive’s Sudan Medal, the latter coming with up to 15 additional clasps. Colour Sergeant Archer, 2/Rifle Brigade, received his medal in early 1899. In March that year he wrote to his mother telling her that he was getting the [Queen’s?] Sudan Medal and “[hopes] to get an International Star for this place.” On 8th April 1899, in an obviously underwhelmed state of mind, he wrote to his brother that that: “We received our [Sudan] medals, got them last Monday, they are though in a very crude condition having no bar nor the names on.”  Unfortunately for Archer, no International Star was awarded for service in Crete. Liddle Hart Collection, Kings College London. ARCHER. This entry was posted in British Army in Crete, European Intervention Crete, Greek Army in Crete, Uncategorized and tagged 2/Rifle Brigade 1899, Crete 1898, The Sudan Campaign 1898. on October 30, 2016 by Mick McT. 4th Mountain Battery Royal Artillery. Candia 1897. 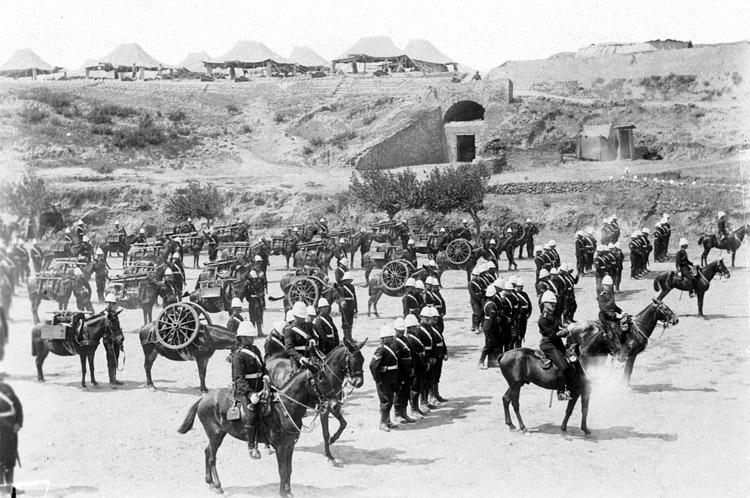 The picture shows the Royal Artillery, 4th Mountain Battery, commanded by Major H.C.C.D Simpson, who arrived in Candia on 26th April 1897 on S.S. Samaria. An ‘Extract from Digest of Services of the above Battery’ dated 9th December 1898 and lodged in the Royal Artillery Archives, states that they were equipped with 2.5-inch Rifled Muzzle Loading guns, weighing 400 lbs. each. Assuming that this is not simply a photograph of them being inspected by Colonel Herbert Chermside, Commander of the British force at the time, on 29th April, it was probably taken on either one of two parades. The Battery doesn’t appear to have fired a shot in anger but was deployed on at least two occasions. On 9th (?) December, the bulk of the Battery having returned to Malta on S. S. Jelunga on November 21st, the remaining detachment …‘accompanied Sir Herbert Chermside to the outposts, and [was] fired on for ½ hour by Insurgents.’ * This detachment arrived back in Malta, via S.S. Augustine, on 21st December 1897. 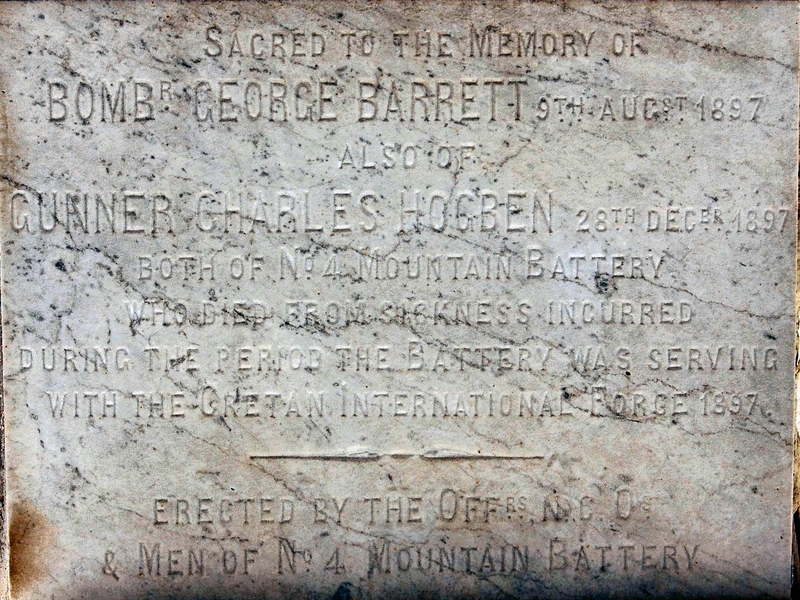 Two men of No.4 Battery died… ‘from sickness incurred during the period the battery was serving with the Cretan International Force.’ Bombardier George Barrett, died 9th August 1897, and Gunner George Hogben, died 28th December 1897. Both appear to have died on Malta, and are buried there: their names do not appear on any of the memorials in Crete. Maltese memorial to Royal Artillery dead. *Colonel Herbert Chermside became Colonel Sir Herbert Chermside by virtue of being made a KCMG in Queen Victoria’s Jubilee Honours list on 22nd June 1897. National Archive WO33/149. Telegram, Colonel Chermside to Secretary of State for War. 9th June 1897. This entry was posted in British Army in Crete, European Intervention Crete and tagged Candia, Crete 1897, No4 Mountain Battery Royal Artillery, Royal Artillery Crete 1897 on October 13, 2016 by Mick McT.